These are superior quality rear silencer boxes employing wadding of the highest grade and are of oval design to make best use of the space available under the car and maintaining optimum aerodynamics. They are for the Maserati 3200 GT Roadster 3.2 litre V8 engine. Although these will not fit the 4200 model we do have tail pipes available for the 4200. These boxes are made from 304 grade Stainless Steel and are designed using a 2 1/4" (56mm) outside diameter pipe on the inlet. They have a 3 bolt flange joint positioned for connection to the O.E. exhaust system. We also have available sports racing rear pipes that do not have silencers on them. This gives the car a more aggressive V8 sound. Please click here for a video of the sports system. Does this system make a drone noise? This drone noise is actually an incorrectly designed exhaust part which is causing a resonation and annoyance to the driver. 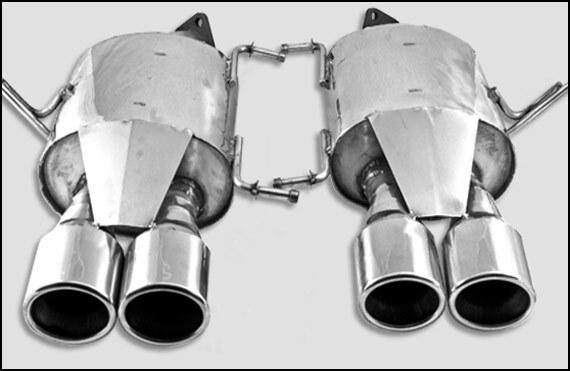 Our exhausts are always designed and tested on vehicles and are built by JP Exhausts and we have not had any customers that have not been happy with any of our exhaust options.